Prime Minister Saad Hariri Tuesday rescinded his resignation that he submitted in a broadcast from Saudi Arabia early last month, after securing ‘dissociation’ pact from other cabinet groups including Iran-backed Hezbollah. 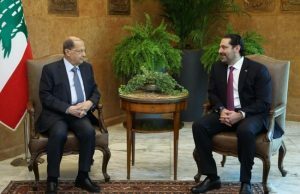 Hariri accepted to continue running his one-year old cabinet that he on November 4 announced leaving in a televised address from Riyadh where he sought refuge. He also said that Lebanon will stay away from the internal affairs of Arab Gulf countries. The Saudi ally returned home two weeks ago after spending nearly two other weeks in Riyadh where he accused Iran and its ally Hezbollah of causing mayhem in the region. Lebanese top officials did not believe Hariri resigned on his own but suggested that Saudi Arabia coerced him into stepping down. They also believed he was put under house arrest and limited in his movement. The resignation brought the country at the forefront of regional proxy conflict between Saudi Arabia and rival Iran. Hariri returned to his country following top level French intervention. He left Saudi Arabia to France, then to Egypt and later for a brief stopover in Cyprus. Upon returning home, he put his resignation on hold to give chance to new negotiations. The Sunni leader is expected in Paris on Friday to attend a France-sponsored meeting aimed at shoring up the Lebanese government. Paris welcomed his decision to remain in his position as Prime Minister. Posted by KanelkaTagba on Dec 6 2017. Filed under Headlines, World News. You can follow any responses to this entry through the RSS 2.0. Both comments and pings are currently closed.